A huge part of your big day is the exchanging of the rings, and it may come as a surprise that there are many different styles of wedding band. From a distance, most wedding rings may look like plain bands, however there are several things to consider when choosing your ring. Firstly, what shape do you want? This all depends on how you want your ring to fit around your finger. Generally, court shaped rings are the most traditional and therefore popular style when it comes to wedding rings. 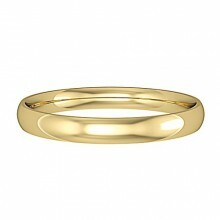 With a court shaped ring, both the inside and outside of the ring are rounded to ensure maximum comfort on the finger. Another popular choice is the D-shaped wedding ring. These rings are flat on the inside but rounded on the outside, offering a comfortable fits that sits close to the finger. If you're looking for a more modern approach to the traditional wedding ring, flat wedding bands are both flat on the inside and also the outside, providing you with a modern, chunky style that feels substantial and heavy in comparison to other ring shapes. 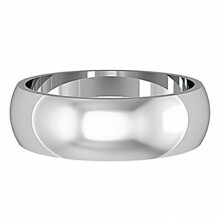 Alternatively, you could opt for a flat court ring, a combination of the flat wedding band and the court shaped band. Flat courts feature a flat edge on the exterior but are curved on the interior, giving you that modern feel of the flat ring but with the comfort and traditionalism of the court ring. Similarly to the traditional court ring, flat-sided courts are rounded on both the interior and exterior sides of the ring, however they are less domed than the court ring. Flat courts tend to weigh slightly more than a court ring and appear to look deeper on the finger. The flat sides enable the flat-court ring to sit comfortably alongside most engagement rings. A slightly different design to the others, halo rings are perfectly round when viewed as a cross section. They are comfortable and offer a more elegant approach than most traditional bands. 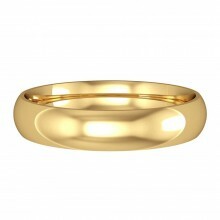 Alternatively, you may wish to go for something a little less traditional in the form of a shaped ring. 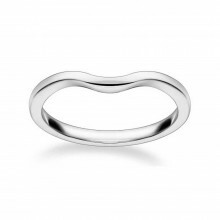 Most shaped rings are crossover or wishbone rings, offering a unique twist on the traditional wedding band. 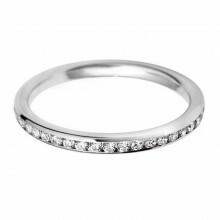 For a touch of sparkle, why not go for a diamond set wedding band to compliment your engagement ring? When choosing your wedding ring, you will also need to consider the width of the band. Traditionally, women wear a narrower band than men, usually between 2.5mm and 4mm, and men tend to opt for a width of 6mm to 7mm. Finally, choose your metal. We offer a wide range of wedding bands in 9ct and 18ct white and yellow gold, as well as platinum, palladium, sterling silver and titanium. The metal you choose will depend on your budget as well as lifestyle factors such as jobs and hobbies. If your job involves manual labour, you may wish to opt for a platinum or palladium ring as these metals are known to be more hard-wearing and scratch resistant than gold. Promise Rings vs Placeholder Rings - What's The Difference?